I committed the cardinal sin of movie reviewing--I bought into the hype of a movie before I even saw it. Award accolades, overzealous twitter praise, and critical acclaim has surrounded The Hurt Locker for months since its theater release last spring. Going into the movie this evening on its DVD premiere day, I was expecting magic on screen. But I didn't get that. However, I didn't mind the film. But I think had the hype not been swirling around me (and had I not admittedly immersed myself too much in it), I would have watched this movie for what it was--a well made war film documenting life in Iraq through the eyes of an elite American bomb squad. 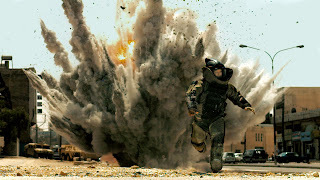 Amidst a country devastated by war, young soldiers James, Sanborn, and Eldridge (played by Jeremy Renner, Anthony Mackie, and Brian Geraghty, respectively) slither through streets riddled with gunpowder, bullets, broken glass and debris, in efforts to deactivate some of the most intricate bombs they'd ever encoutered. Day in and day out the men struggle to survive the last few weeks of their deployment in a somewhat alternate universe which has too comfortably become their home. Just like so many soldiers before them, they've become desensitized to the status quo until the reality of what they're doing opens their eyes, but for just a moment--a moment they'll never forget. I thought Anthony Mackie was impressive in this role as the tough semi-veteran of the trio, and Renner was unforgettable as the adrenaline junkie always looking for his next hit. But I think the biggest star of the movie was director Kathryn Bigelow whose intense direction stole the show and truly depicted a country that had essentially become one large ticking bomb. I probably should have seen this movie when I had the chance in theaters, but as a DVD it didn't live up to the hype, though it was well done. I had very similar feelings towards this as you did. What sold me on this though was that second viewing. All the things I missed the first time because I was looking for the plot and not the characters, it's quite an amazing second visit. Excellent review. It's always tricky to try to block out all the hype that comes with critically acclaimed movies. The best thing for me is not to read other people's review until you have actually seen the movie. I felt exactly as you did on seeing this movie last night. I don't know what I was expecting, but it didn't live up to the hype. Still, it was a good movie for what it was. And I find myself thinking about it even now, and realizing that the scene near the end where James goes home to his wife and son, and is choosing cereal in the supermarket, clearing leaves from his gutter, cutting up vegetables, was just devastating. It was the first movie that made me understand why soldiers choose to re-up, even after they know how terrifying and messy and brutal the theater of war truly is. I plan to watch this again, though, given Univarn's comment above. Completely agree, although I may have appreciated it a bit more. I thought it was one of the best Iraq War movies I've seen, but the hype was deafening. I am very curious about seeing The Hurt Locker. James Cameron said he expected that movie to win best director instead of him at Golden Globe Awards.